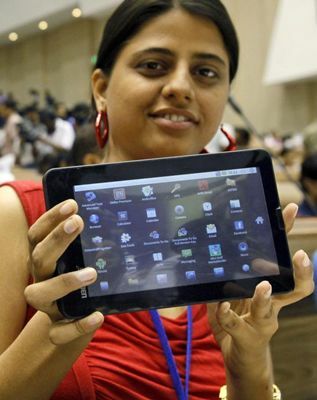 Early this month India launched touch-screen tablet PC, which is known as “Aakash”. That is priced at just $35 compared to its counterpart OLPC which was originally priced at $100 and then increased to $180 - $200 later. The Aakash has been developed by UK-based company DataWind and Indian Institute of Technology (IIT - Rajasthan). Mr. Kapil Sibal, the minister of the Indian Human Resource Development Ministry hopes Aakash will give digital access to students in small towns and villages and end the digital divide in India. One which has balanced the price and the features to fulfill the needs and wants of its target audience would be the most successful and sustainable laptop in the world. Comparing the Aakash PC-tablet and the OLPC computer puts too narrow a focus on what is going on here. From the beginning the OLPC was an ill-conceived project based on the assumption that a computer in the hands of students in developing countries was preferable to initiatives that strengthened the abilities of teachers and the overall educational system. It was all ill-designed “silver bullet” strategy that has been overtaken by technological change. First of all, any primary level educational initiative that does not focus on capacity building is doomed to general failure, with an occasional “poster child” instance of success. The challenges of ICT in the curriculum, and for self-paced learning, remain considerable and while they are apart from the technology itself, the technology is becoming a more affordable and more user-friendly part of the solution. Having said that, let’s drop down and focus on the technology dimensions. There are two directions of ICT technological change underway here. The first is the rapid deployment of the cell phone, and increasingly the (internet) smart phone. The second is the slower, but still rapid, evolving of the computer into the netbook and the tablet. For educational use one key factor is the availability, or non-availability, of devices to use the phone or tablet as a production device (keyboard, auxiliary devices, etc.). Another is access to programs (apps) and their updates, as well as the ease of maintaining or replacing equipment parts. The OLPC device has consistently had trouble on these fronts. In general, the smart phone and the tablet are still better for ICT consumption than for ICT production. The Aakash PC-tablet embraces an auxiliary keyboard allowing it to be mobile with a touch-screen keyboard, and more stationary with a traditional keyboard. Two things are clear here. The convergence of cell phone design and net/tablet design will quickly produce a menu of ICT options that are affordable across varying degrees of capacity. They will be mass-produced to common standards (Android, etc. ), allow socio-educational networking across time and space, and have relatively free access to apps and app updates. What is important is what we do with the technology to strengthen the capacities of educational systems. It is a waste time betting on them like horses in a horse race. The OLPC device is a flawed strategy whose time has passed. The Aakash PC-tablet is just one more stepping stone on a path where good ICT assisted educational planning can unlock innovative human spirit for billions across the globe….but the technology will not do it by itself and focusing primarily on the technology is a mistake. Thanks Aakash for the information on processor. Hi Sameera, that's a lovely way to frame the audience question. I hope you will post updates on the project as it unfolds. As I understand it, the unit price for the Aakash is targeted for $70, which will be half subsidized by the government. That still puts it on the inexpensive end of the spectrum of tools available for students -- imagine if all smartphones were available, unlocked, at such a reasonable cost! The OLPC laptop also has two USB 2 ports, and the latest version has an 8GB hard drive. It is good to see innovation like the Aakash in the realm of education-focused computing; I hope the concept is developed and carried out well, with a focus on use and collaboration, not just technology. Hopefully what OLPC has learned regarding power management, connectivity, connected classrooms and hard-to-break/easy-to-fix design will be useful for this and other similar projects. All of ourwork is public and free for others to use; we reached out to offer support to the project last year, and continue to support the idea in spirit. Lanfranco seems to confuse devices with strategy. Giving every child their own tool to access digital knowledge is part of a world-class education, something we should enable sooner rather than later. There should certainly be a wide range of devices to cover various circumstances. The idea of "one laptop per child" is not a competition, but a collaboration the whole world - and every major computer manufacturer - should take part in. The XO laptops were designed to demonstrate what is possible at very low power, under difficult environmental conditions -- much more can be done, more easily, to saturate urban schools: those are areas where one hopes market forces will drive innovation. We are committed to solving problems for regions where there is no short-term market. Lanfranco and Klein - I respect your different views on the topic. I tend to agree with Sam Klein. Clearly, what Sam Lafranco says "..but the technology will not do it by itself and focusing primarily on the technology is a mistake." is fairly accepted in ICT4D environments, but noone says that availability of an innovative device has to correspond to poor educational (or developmental) strategies. And, incidentally, would the world be different if mobile phones still costed about 200$ a piece, as was the case not ages ago...? i want to purchased this tablet.where can i buy this? UK-based company DataWind or Indian Institute of Technology (IIT - Rajasthan). 1.I agree with SK views. 2. For a lay man like me, I would go for a laptop that my child can use in bright sunshine, during rain, or in the swimming pool, and is drop-proof. My child should be able to connect with his class mates to attempt group assignments via a mesh network. S/he should be able to utilize learning resources generated by people around the globe. 3. Does AaKash offer these?